Things just went from simple to complex. The push bike was simple; no gears, no brakes, no weight issues, and no second mortgage on the home. But now, the fun begins. Gulp. Choosing your first 14teener is a big step for many families as the majority of parents grew up riding a hand-me-down, heavy steel beast or a bike that was bought from a big box store. And we were fine with that. Out with the old and in with the new. Aluminum frames, freewheels, hand brakes, and bears…oh my. Searching online for advice provides parents with a dizzying array of options. 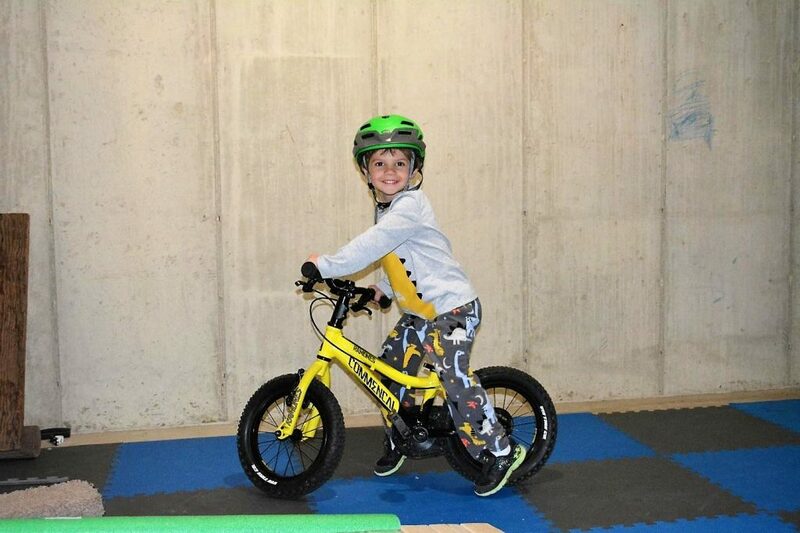 How early in a kid’s life do you apply the “buy the best bike you can afford” philosophy? Luckily, Commencal has taken all the guessing out of the equation for all of the moms and dads out there looking for a great 14-inch bike. Not the lightest 14teener available, but certainly not heavy at 15.4 lbs. Wow, does this bike look tough! The pictures don’t give this little ripper justice as everywhere we have taken it, our boys have always received compliments. Not quite sure if it is the design of the frame with its atypical shaped top tube or the 2.25 inch Vee Tire knobby pair of rubbers, but whatever the “x” factor is that this bike has, you’re going to love it. Commencal is a major player in the downhill scene and, although this bike doesn’t share the same angles and suspension that a downhill bike has, if your son or daughter rolled up to a team tent on this bike at a DH event, expect the pros to give them a fist bump. We sometimes overlook these little details and focus more on the big “parts,” but if your child is uncomfortable sitting on the bike, they are not going to be riding it very long. Many companies build kid bikes as an afterthought, but it seems Commencal put in the time to build a bike they could be proud of. The bike is of course a single speed with a 28 tooth chainring up front and an 18-tooth cog in the rear. Although the cool factor goes down a bit with the plastic covering that protects the drivetrain, it does protect your child’s pant leg from getting chain grease on it. It could be removed if desired…just a couple of screws. Running a single has its pros and cons. 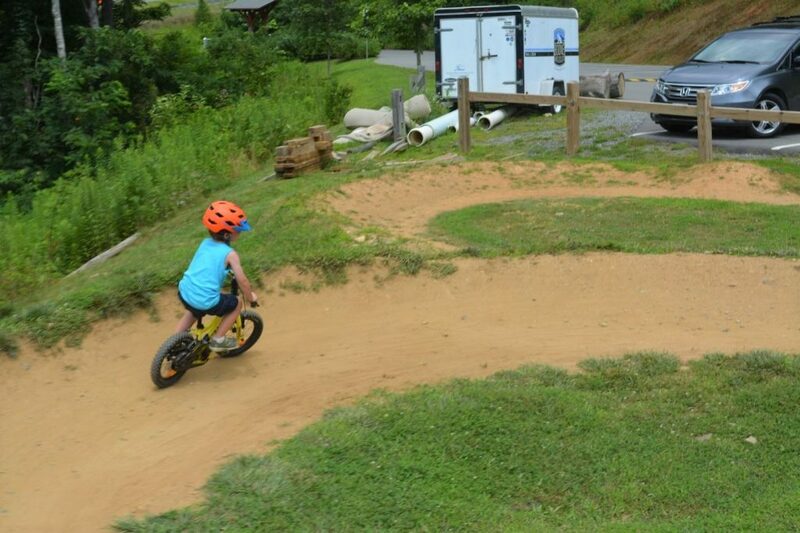 Super simple to operate for a toddler and almost zero maintenance for mom and dad, however, you can expect them to spin out pretty quickly when riding on anything but dirt. Anything too large up front will make starts difficult and anything too low and they’ll be cranking the pedals at 130 rpm trying to keep up. We are happy with the gearing and our boys have never complained. 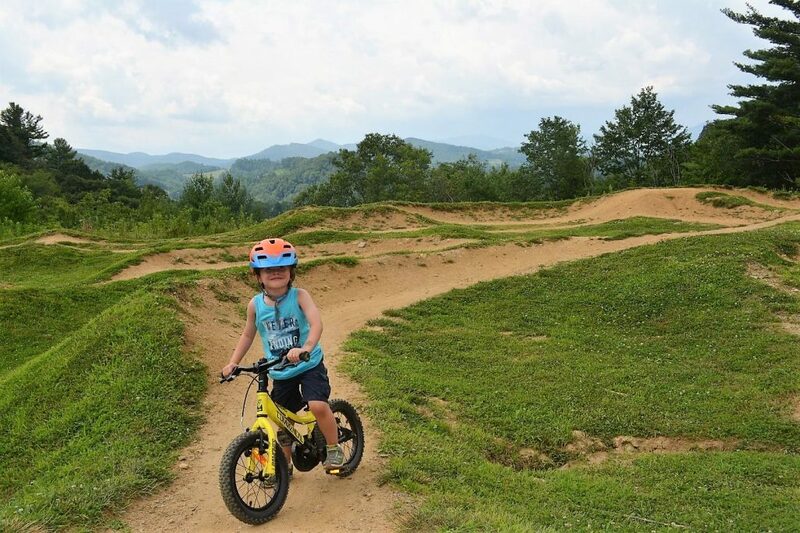 They’ve used this bike in the bike park without any complaints and depending upon the skill level of your child, the bike can hold its own on singletrack. From a safety standpoint, this dad was okay with the gearing as it acted as a speed limiter for our four-year-old. 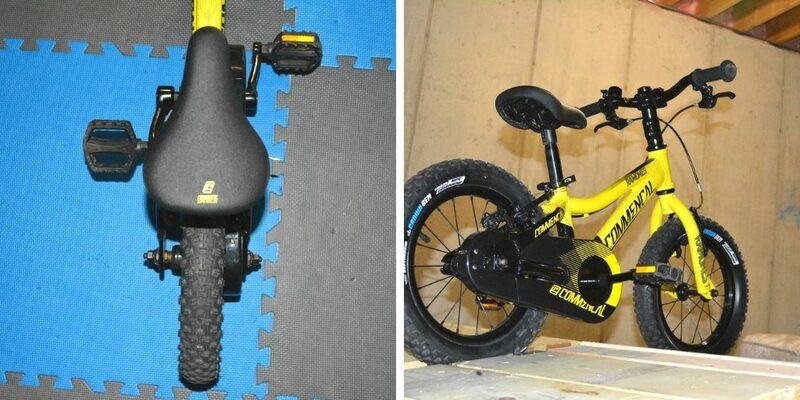 Most kids will be making the transition to this bike from a balance bike or a bike with training wheels on it. Commencal understands this and includes a set of training wheels when you purchase the bike. We never installed ours and were lucky to have both boys take to pedaling pretty quickly. Our oldest, almost instantly. With our youngest, he wasn’t too sure about the whole pedaling thing, so we let him grab the pedal with one hand while we lifted the bike and he could see the affect of the round and round movement of the pedal. Don’t think he was calculating any engineering grade math equations in his head, but either way, he got the point and it worked for us. It’s worth a shot if your lil’ one is struggling with the concept. Commencal also includes a headlight, bell, and taillight with each Ramones 14 purchase. We weren’t swayed in the Ramones’s direction because of these of course, and neither will you be. The headlight snaps onto the handlebars and the rear taillight attaches via a small rubber band. They aren’t bright enough to warrant riding at night, but I don’t think many toddlers are logging miles in the dark anyways. Why are they included? Its simple. You were three once and if you got a new bike for your birthday, do you think you would show all of your friends and family members the really cool seat that came on your bike? What about the awesome pedals? Exactly. 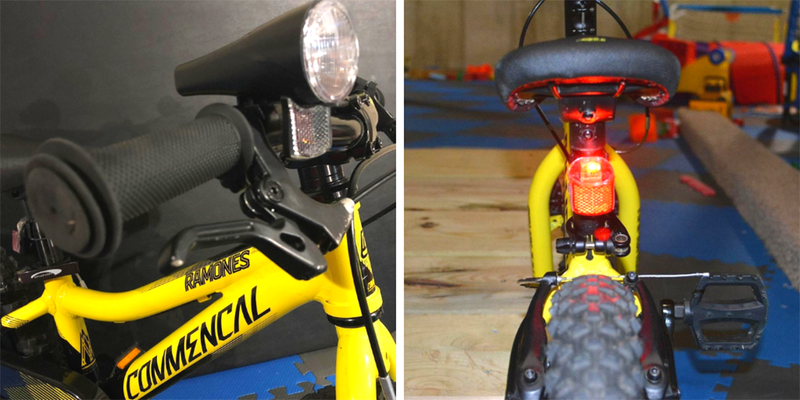 Kids love “bling.” Not every kid in the neighborhood is going to have a bike with a light and/or taillight and that will make them feel special. We’ll take those small victories whenever we can get them. Our son loved the bell. He called it his “look out!” bell. Completing the rad look of this bike are the all black tires, wheels, and spokes. Don’t think I have what it takes to make these any cooler than they are, so I’ll just state that they are good enough. What I would like to see improved is the freehub in the rear wheel. When riding an adult bike, once you stop pedaling, you can enjoy the freedom of getting free distance without expensing a single watt of power. On the Ramones 14 however, it seemed that once our sons stopped pedaling, the rear wheel would start to experience drag. If you can remember the old exercise bikes that had the fan blades for a front wheel, when you stopped pedaling, you could instantly feel the resistance start to slow your momentum. That is the best way to describe the rear hub on this bike. We don’t have experience with every 14-inch bike wheel hub on the market, so forgive us if we are making a complaint that is unwarranted, but it may be something worth checking out before you buy. To be fair, our son’s Woom 3, with the upgraded Sram Automatix hub, does the same exact thing so take my opinion with a grain of salt. Even though the Vee Tires have an aggressive tread on them, we never felt that they rolled any slower than a traditional trail tire. They are not going to run as fast as a pair of Kenda Small Block 8s or a road slick, but once you hit the dirt, your kid will like the stability and comfort that comes from the 2.25” little tires. The size may seem a bit wide for a kid tire, but we felt that they provided a nice contact patch for our young rider on multiple surfaces. 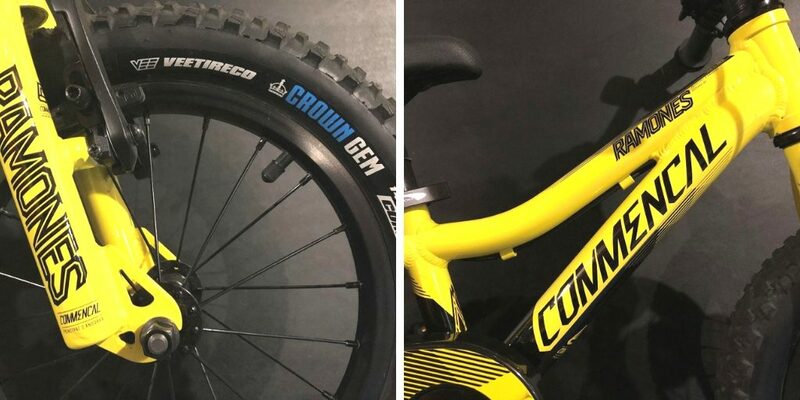 Many bike manufacturers stick to narrow road style tires for their kid bike builds (cheaper, lighter and sometimes more appropriate for the style of riding kids do), but I appreciated Commencal staying true to the design and “culture” of the bike. Another nice feature found on the Ramones that is not common on 14ers is a quick release skewer for the front wheel. The rear is still a traditional nut (which is understandable if using training wheels). Bear with me while I lay a little foundation before getting into the Ramones’s brake setup. Most of us learned how to ride a bike that had a coaster brake (you engage the rear brake by pedaling backwards) so what is with all the talk about how great handbrakes are king? A great deal has changed over the last decade or two. Our two boys went straight from their STRIDER to the Ramones and with about 5 minutes worth of coaxing and instruction, they were pedaling around the block without putting their feet down. Best of all, they were 3 and ½ years old. Other kids in the neighborhood were furiously trying to learn how to ride and the parents were scratching their heads wondering why their kid was having such a hard time. It was simple. Their kid would pedal once, twice, and then when they would start to lose their balance, they would stop pedaling and try to right themselves. And there’s the rub. The minute they stop pedaling, they try to flatten both of their feet to remain upright, but the instant one of the pedals moves backwards, it engages the brake and with no forward motion, down goes Frasier (insert your kid’s name if it helps). A couple more attempts yields skinned knees, torn up knuckles, and a very upset and frustrated child. Hand brakes remove this hurdle. Commencal has spec’d their Ramones 14 with Tektro v-brakes which check two of my favorite boxes: easy to use and easy to adjust. 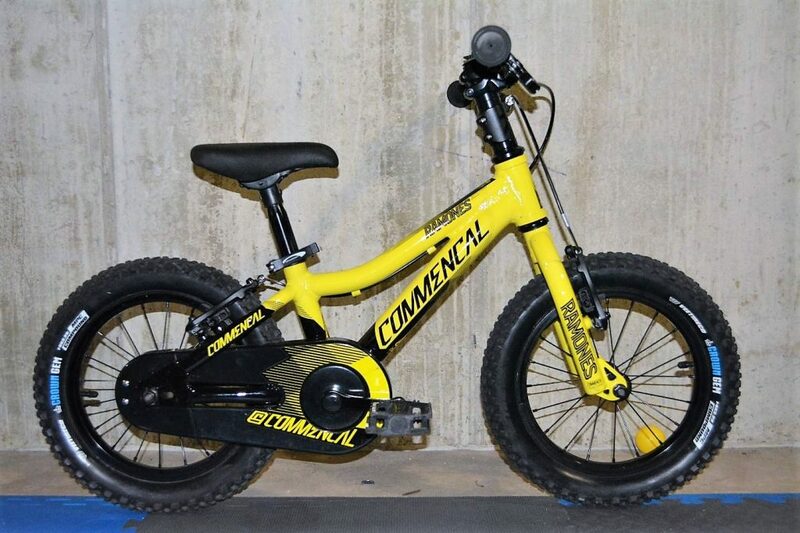 With the intended driver of this bike being in the 3 to 5-year-old range, Commencal was smart to choose brakes that work well for any sized paws. With a simple turn or two of an Allen key, you can bring the brake levers closer to the handlebar grips or push them out as hands grow over time. It may not seem like a big deal to mom and dad, but it’s a huge deal to a kid riding a bike who eventually wants to stop. From the levers, cables, calipers, all the way to braking performance, these brakes receive an A+. And for the aggressive rider of your bunch, please pass on to them that they too will be able to leave those awesome skid marks on the driveway just like their older sibling. The brake setup is clean and everything blends in nicely with the black grips and handlebars. Yes, looks matter, even to a 3-year-old. According to Commencal’s website (www.commencalusa.com), they built this bike for a child somewhere in the range of 37 to 43 inches. The minimum seat height is 17.9” but that is just a number, not a tell-all of whether the bike is the right fit for your kid. Regardless of their height, neither one of our boys ever seemed to have trouble with reaching the handlebars, throwing a leg over the seat, and/or reaching the ground when stopped. We found that within a couple of rides, we were raising the seat to allow their legs to have proper pedal extension instead of worrying about whether they could touch the ground while seated on the bike. Our son in the picture wears 4T pants. We did add a couple of minor “sizing” upgrades. 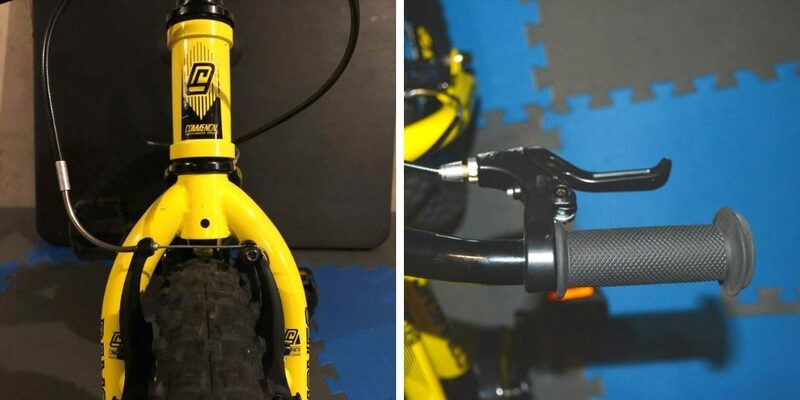 First, we installed a quick release clamp for the seatpost (as shown in some of the pictures) since this bike gets ridden by almost every kid in the neighborhood. Simple and inexpensive fix, but one that saves a bunch of time when needing to adjust on the fly. The second item was a fork extender (also shown in a few of the pictures). As our son grew and we were not quite ready to purchase a 16-inch bike just yet, the seat kept getting raised while the handlebars seemed to get lower and lower with each passing month. Once again, a simple solution that allowed our son to get a few more miles out of the bike. If Santa could offer early or late delivery, instead of only delivering expensive new bikes on Christmas, it would make this father extremely happy. When we first purchased the bike for our oldest, people had a looksee and saw the fancy parts and paint job on the Ramones 14, jumped on their phones to search the “interweb” for it, and then gave me the “you spent that much” look. We’re so used to paying by the pound for something; the more it weighs, the more you will likely pay. In the biking world, its totally opposite; you pay more when it weighs less. As Kristen mentions, the weight of big box store bikes is outrageous, but that is not the case with the Ramones. With a weight of 15.4 pounds (according to my scale), it is a heck of a lot of bike and punches well above its weight. Of course, there are lighter bikes in this ever-growing category, but most of them will not have a freewheel, front and rear handbrakes, and knobby/high quality tires. I felt as if the weight gave our sons some stability when riding, even when at speeds that freaked mom out a bit. If you’ve made it this far, chapeau to you for putting in the effort for the soon to be owner of a rad 14-inch bike. 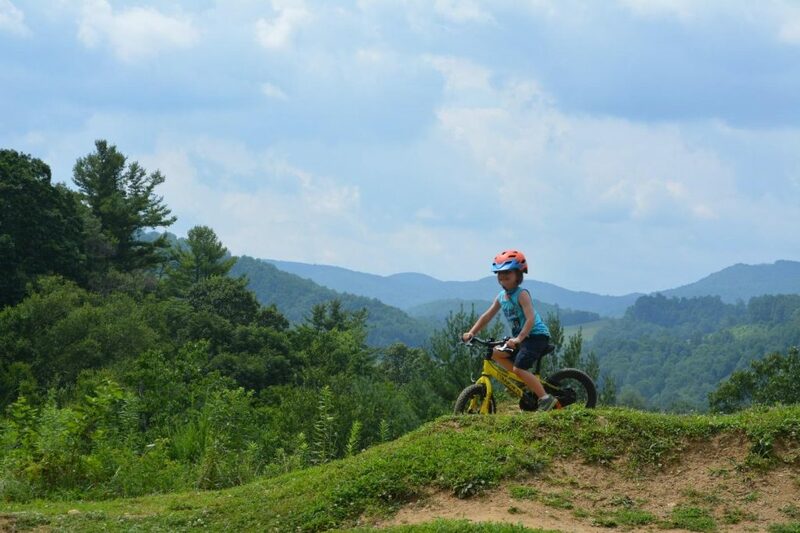 We often get caught up on the dollars and cents of things we buy for our kids, but if you break it down into hours of enjoyment, this bike could be the best bang for your buck you’ll ever find. It’s equal to about four or five LEGO sets, but the difference is, this purchase could just be the one that brings a tear (or many) to your eye as you see them pedal away from you for the first time, the gift that brings the biggest smile as they pass you while yelling “get on my wheel dad,” or whatever awesome memory you can imagine that comes only from riding a bike. To be honest, I got “timed out” on the checkout screen probably four times before finally hitting submit. At the time, it seemed like a lot of money, but now three years later, as both of our boys have progressed nicely from one bike to the next, I owe most of their riding success to the bike choices that my wife and I made for them. If they enjoy it, they will do it. The Ramones 14 made riding a bike enjoyable for our boys. From the cockpit (reach, easy to adjust brake levers, comfortable seat, etc.) all the way to the sweet paint job, knobby tires and great looks, Commencal has hit the mark with this lil’ bike. It is definitely a bike to consider. Want to know how the Ramones 14 compares to other 14″ bikes? Check out our list of the best 12″ and 14″ bikes and read other reviews.